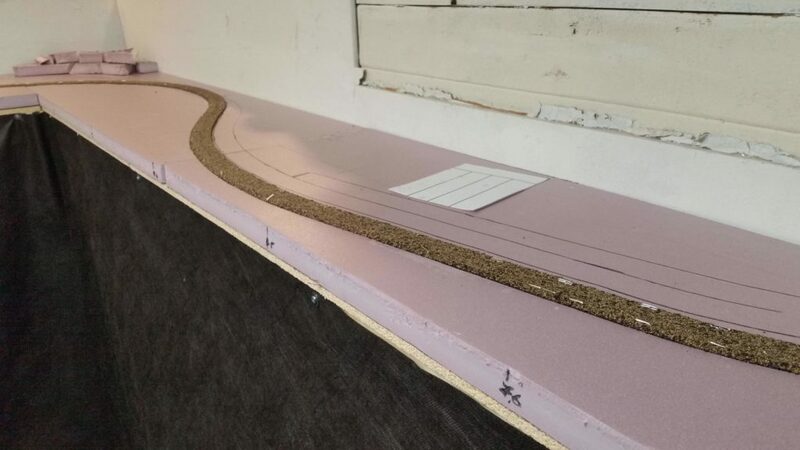 Model railroad track is installed on top of a “roadbed” made of either cork or foam. This recreates the raised grade that the track of real railroads is built on. 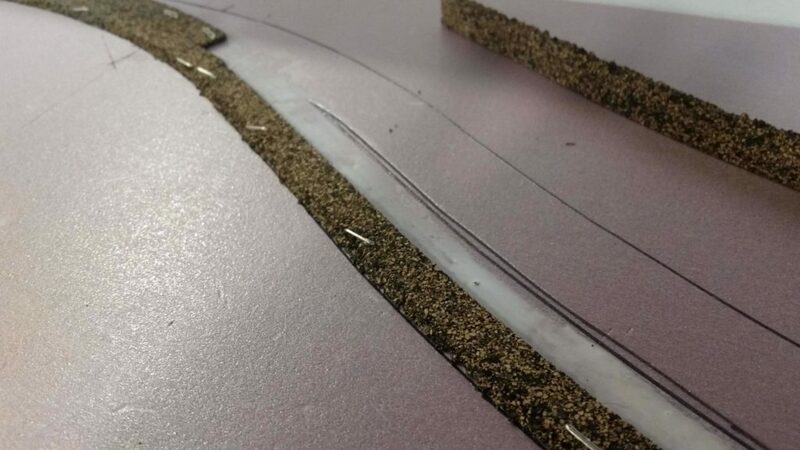 On “Scenic Ridge”, I used the foam roadbed included in the kit. To be honest, I was never that impressed with it. This time, I decided to go with the tried and true cork roadbed. It’s fairly cost-effective and as I discovered, easier to work with than the foam. I chose to purchase roadbed made by Midwest Products. To install the roadbed, I used regular Elmer’s white glue. I put down a heavy coat of it, brushing it smooth with a 1″ foam brush. The roadbed is cut diagonally down the middle. To use it, you break it in half down the split and turn each half around. This gives you the sloped sides that you see on the full-size railroads. The cork can flex around a 9.75″ curve easily. 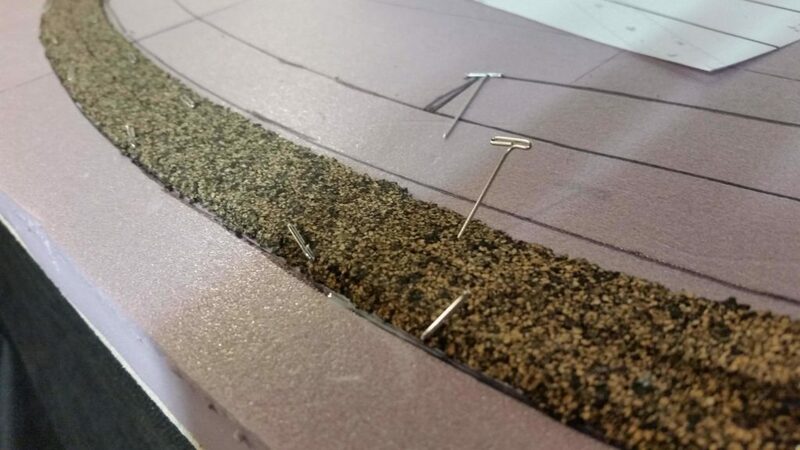 Once the glue was down, I put down the roadbed, pinning it in place with 1.25″ T pins inserted at an angle. I learned a few lessons while installing the roadbed. The first is that it works much better if you lightly sand the surface of the foam insulation first – this gives the glue something to “bite” to. The second is to use more glue. Finally, I learned to work in smaller sections, the Elmer’s glue starts to set too quickly. 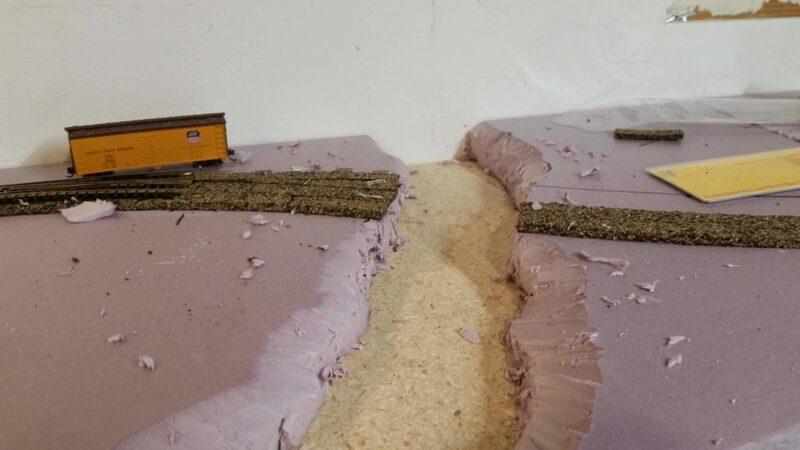 While I was installing the roadbed, I decided to cut the basic shape of the river. This is where the use of rigid foam really comes in handy. I was able to cut the basic shape with my swiss army knife. 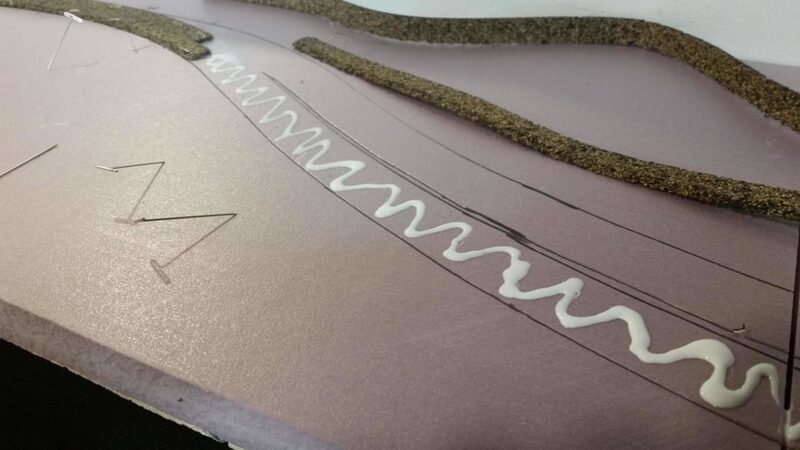 Cutting the basic shape of the river. To start with, I only ordered enough roadbed to install the mainline. I wanted to be able to at least run trains as quickly as possible. Once the roadbed was down on the mainline, it was time to lay some track!